Are there really classes about exorcism? Did the real Michael Kovak take classes in Rome to become an exorcist? Yes. 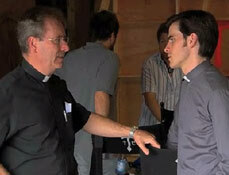 According to The Rite true story, Father Gary Thomas, who is portrayed by actor Colin O’Donoghue in the movie, attended exorcism classes, among others, during his nine month stay. He arrived in Rome during the summer of 2005. 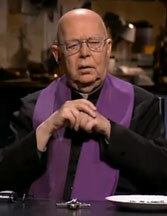 Did the priest and the journalist work together after meeting in exorcism class? Yes. Male journalist Matt Baglio and Fr. Gary Thomas met in the class. As the only two Americans in attendance, they quickly bonded. In the movie, the journalist is portrayed as a female named Angeline (Alice Braga). Did the real Michael Kovak follow a practicing exorcist like Anthony Hopkin’s character, Father Lucas Trevant? Did a woman really spit up nails during an exorcism? Did Fr. Thomas work in a funeral home? Yes. While attending a funeral as a teenager, Gary was approached by one of the owners and asked if he wanted to work there part time. At the age of 14, he accepted employment and began working odd jobs at the Nauman Lincoln Roos mortuary. Was Gary Thomas always a man of the cloth? How many exorcists are there in the United States? Has Father Thomas ever witnessed a death due to a possession? No, not according to The Rite: The Making of a Modern Exorcist book. Did the frogs really appear? actor who plays him, Colin O'Donoghue. Did a car accident bring the real Michael Kovak back to his faith? No. Unlike in the movie The Rite, he was not a seminarian who had lost his faith. He was a fifty-year-old priest at the time and was asked by his bishop to participate in an exorcism course at the Pontifical Regina Apostolorum University. The course was titled "Exorcism and the Prayer of Liberation". Was Father Carmine ever taken over by a demon? No. Unlike the movie, the real Lucas Trevant, Father Carmine De Filippis, was never possessed by a demon. However, like all exorcists he can be and claims that he is often times attacked by demons. Did Father Thomas's dad really die after a premonition? Matt Baglio's book does not support this element of the movie. Did they really encounter a child with hoof prints on him? No, not with regard to The Rite true story. However, having marks, letters or signs appear on a victim’s body for no apparent reason is not unheard of. A physical attack which can also include pushing and hitting is categorized as oppression, one of the four types of demonic extraordinary activity. What are the signs of a possessed being? How does a demon present itself during an exorcism? What is the process of an exorcism? Each exorcist has their own touches but all follow The Ritual. This book, originally referred to as the Roman Ritual, was published in 1614 but has been revised a few times throughout its history. The current text is known by its Latin name, De Exorcismis et Supplicationibus Quibusdam (Of Exorcisms and Certain Supplications) in the Revised Ritual from 1998. They begin with a blessing and sprinkling of holy water on the afflicted. Often times the exorcist will place their hand on the person's head and begin the rite, including prayers, homilies and psalms; some of which are standard while others can be chosen by the conductor. At the end, the priest will usually bring the person out of the trance by tapping their head. notes with The Rite author Matt Balgio. How many exorcisms has the real life priest done since completing training? How many hoaxes does Fr. Thomas typically encounter? The real Reverend Gary Thomas does not consider any person seeking help as a hoax. While many people truly believe they are in need of an exorcism, few actually do. It is for this reason that everyone requesting the service is put through a variety of tests conducted by his team, which includes a clinical psychologist, psychiatrist, physician, two additional priests, and occasionally other professionals like therapists, who together help him determine a course of action. This process is referred to as discernment. If everyone is in agreement, the request is made to the bishop who gives the final word (Busted Halo). Hollywood has put people under the impression that an exorcism is a onetime event that frees the person from a demon, but that is not how it works. The afflicted undergo numerous exorcisms, resulting in temporary liberations which eventually can cause a demon to flee. The Vatican's chief exorcist, Father Gabriele Amorth, explores these factors as well as his experiences and the history of exorcism in his book An Exorcist Tells His Story (available at right). Some of Priest Gary's favorite prayers to use during an exorcism can be found at the back of this book. Has Fr. Gary Thomas ever witnessed anything similar to the infamous scene in the movie The Exorcist? 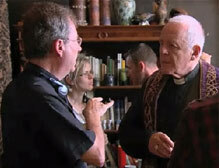 scenes with actor Anthony Hopkins. Does participating in this movie open up the actors to demonic possession? Where does Father Gary Thomas work now? He is a priest at the Sacred Heart Parish Church in Saratoga, California, as well as the mandated exorcist for the Diocese of San Jose. How much of his time is spent performing exorcisms? 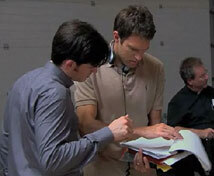 Watch Father Gary Thomas interviews and other video exploring the true story behind The Rite. Highlights include interviews with Reverend Gary discussing exorcisms, the Vatican's chief exorcist Father Gabriele Amorth showing where he works, and video of Fr. Gary talking about The Rite movie and ways to avoid opening yourself up to demonic possession.